THE 2018 IMPACT OF INFLAMMATORY BOWEL DISEASE IN CANADA REPORT, AND CROHN’S AND COLITIS AWARENESS MO - Crohn's and Colitis Canada’s Gutsy Walk to make it stop. For life. 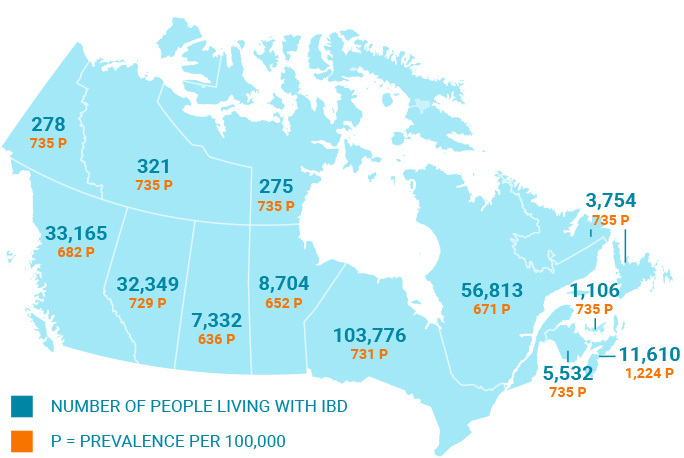 November marks the beginning of Crohn’s and Colitis Awareness Month in Canada, and this year, it also coincides with the release of a significant document – the 2018 Impact of Inflammatory Bowel Disease in Canada report. The report has been prepared by the scientific community to show the effects of Crohn’s disease and ulcerative colitis on individual Canadians, and on the country as a whole. It’s the first comprehensive examination of the diseases and their impact on Canada since 2012. Seniors with Crohn’s or colitis face complications of longer disease duration,and caring for age-related simultaneous conditions such as diabetes and cardiovascular disease. You can download our 2018 Impact of Inflammatory Bowel Disease in Canada summary pamphlet here, and the full report here. Talk about health statistics often alludes to 'the people behind the numbers.' Well, for this year’s Crohn's and Colitis Awareness Month, we're putting people right alongside the numbers. Throughout November, we'll be sharing an image of a Canadian impacted by Crohn's or colitis, along with a fact from our 2018 Impact of IBD in Canada report on our social media channels (Facebook, Twitter, Instagram, and LinkedIn). Have a look at the faces of Crohn's and colitis in Canada, and please share those posts so we can amp up awareness. This month is also the perfect time to tell your stories about living with Crohn's or colitis on social media using the hashtag #CCawarenessmonth. Crohn’s and Colitis Awareness Month is the perfect time to gain further knowledge about the diseases, how they can affect the body, and how you can take more control over your health. From emerging treatments to diet to pain management, we have videos on a range of topics ready for viewing on our newly updated webinars page. We hope the month ahead is filled with opportunities for you to learn, connect with others, and elevate awareness about Crohn’s disease and ulcerative colitis.